Perseverance furthers, says the I Ching and also Calvin Coolidge. I couldn’t start my new chain saw today. Damn. I know it’s a new tool, but you’d think I could make the dang thing work. Hey, I even had a manual. But I hate to admit how loath I am to study such things. “Click on the cold start icon with the starter lever in safety and the feed bar locked. Hold on with your left arm until it goes numb. Stamp on the thingy that rests on the ground and pull the very reluctant cord that wants to snap your arm off until you hear that wonderful roar of a gasoline engine. Voila!” Yeah, right. Okay, I’ll get it tomorrow. I’ll be more patient. I’ll read the words, call the chain saw guy if I have to, but I WILL MAKE IT WORK. Perseverance. My favorite trait. On what tasks do you bring that slitty eyed, teeth-bared determination to heel? When I was teaching my puppy, Alex, to play ball, we played in the front yard, on the driveway. I noticed that if he missed the ball, he immediately stopped and looked around to see if anyone who might be passing by had seen his mistake. He looked embarrassed, but he didn’t give up. We kept working at it and now he rarely misses. Like people, Alex desires attention, but he wants to be well thought of. He loves praise. (With those characteristics and some typing skills, he’d make a good writer.) He figured out a long time ago that perseverance in learning a task brought him tons of attention and praise. The reward was worth the effort. If Ann wades through her chain saw manual, one painful step at a time, she knows she’ll gain from the experience. In the end, she’ll be out there cutting up wood for her fireplace. As long as the rewards are worth the effort, we all continue to persevere. I knew I would go on when my first pregnancy ended in a miscarriage, same for the second, third, fourth and fifth. I kept going. I kept moving. Life was still worthwhile for me, despite the losses. When my husband left me, I was no longer sure about life being worthwhile, but somehow I plowed onward. I kept moving. I avoided real living, keeping socially isolated as much as possible, while I went through the motions enough to get me through the days. I persevered. Eventually, the crippling pain turned to numbness. With time the numbness eroded away. I rejoined the human race, met my current husband, remarried and went on with my life. Maybe I knew all along there was a reason to stick around. Sitting by my mom as she died slowly, inch by painful inch, required almost more strength than I had inside me. Love and a strong sense of protectiveness kept me at the hospital day after day. I did what I knew she’d have done for me. Sad though it was, the experience was a part of my life, and hers. I wouldn’t have missed being there with her. Perseverance is something we rarely consider, but it’s required of us in varying levels over and over throughout our lives. It can be unbearably annoying to have to muddle through a confusing, boring manual written by someone whose communication skills are, at best, challenged. It may be embarrassing to keep failing when learning a new skill. It is definitely painful to sit with our loved ones as they die. Maybe the smaller situations become training for the bigger, more meaningful events. Perseverance is, after all, how we build strength. You’ve definitely persevered through many very difficult times and have arrived where you are now with much to offer. Somehow, somewhere, sometime, when you least expect it, you will use the strength you’ve gained from your perseverance to accomplish things you still only dream of. These paragraphs are proof of your writing talent; who knows what other gifts you possess. Thank you for sharing and trusting your friends here. Thanks, Shaddy. I took a deep breath and plunged in. Your support is appreciated. Barbara, Your words could have been mine, perseverance through death of a marriage and then with my dad when he breathed his last. As Shaddy has said that experiences will help us help others and that in turns helps us also. Thanks for sharing your heart. Thanks for reading my input, Walk. I agree that these experiences reward us by allowing us to help others. Your words touched my heart today. I also know what it’s like to stay at the bedside of a dying mother. I, too, know what it’s like to watch a marriage die. Only difference is, I’m still living it. Ah, to persevere. Don’t you sometimes want to slap it in the face? Or better Stihl, cut it down with a chainsaw? Love your last line, Kathy. Keep your sense of humor alive and it will return the favor. Barbara, you can tell me a story anytime. I like the “music” of your writing. I definitely use perseverance when I write. I won’t even send an e-mail without reading it and rewording a couple of sentences. It matters to me that what I’m trying to express, comes out right. Training for running races, biathlons and triathlons demands perseverance. I must swim, bike and run every week to maintain a level of fitness whether I feel like it or not. My perseverance has to take charge over my human weaknesses. Once I get myself moving, it’s a constant mind over matter situation. I persevere because I know how I’ll feel when I’m done. I’ll feel strong and that’s a great reward. How did I come to this place? Where did I come from? What roads have I traveled to bring me here? Why do I need to use words like I do? As a child, I persevered when I felt like I didn’t fit in with four brothers, no sisters and a neighborhood of boys. I persevered in spite of feeling abnormal. I persevered after I behaved in ways that made me hate myself and try to end my life. I persevered through years of depression, numerous hospitalizations in psychiatric wards, electro-convulsive shock treatments, and more. I persevered after a miscarriage. I persevered when my son was born and I was scared to death that I’d fail as a parent. I can’t give credit to my own perseverance for getting me through many of my challenges. I’m thrilled to say that my husband, Lon, wins the medal for unlimited human perseverance. I honor him here with a gold medal for loving me unconditionally, loving me always, and for instilling in me the assurance that his love will continue forever and ever. Now I’m wondering if I should post all of this or delete that paragraph that looks back on my life. It’s unnerving when I line up words and then send them out in raw form on a mission of disclosure. Why do it? I ask myself. I feel slightly sick. I don’t have to do this. But, maybe by opening up, I will help somebody else who’s lived through a hell of his or her own. Maybe I will show someone else how to face his or her own past, explore it and then go forward. My words won’t be new to everyone here; I’ve touched on these experiences before. Will I submit it in hopes of sympathy? No, that won’t strengthen me or benefit anyone. Will I submit it to prove how strong and capable I’ve become? No, I’m not strong and capable, just a little stronger and more capable than I once was. I will send it out to remind others that perseverance empowers our hopes and dreams; perseverance allows us to pick ourselves up from the deepest holes and to develop a new way to think and a new way to live; perseverance can and will inevitably reshape our lives IF we choose to persevere. Brave submission, Shaddy. Thanks for sharing these glimpses into your life. I know it’s difficult to open up and let these chapters of history see the light of day again. I believe you wrote these things for the same reasons I did, to help someone who might think they’ve had just about all they can take. Some how, someone has to let people in these situations know that there IS light at the end of their tunnel. They have to keep putting one foot in front of the other and keep going. I think that’s why we write as we do. You are an inspiration in so many ways. Everything you’ve been through has made you a strong and incredible person. And here you are, among friends, cutting up and laughing, pedaling and swimming. (in your underwear, I might add). Keep running. Keep laughing. But please, follow the rules and wear a bathing suit! Or not. I don’t think I’ll make that mistake again, at least not in the near future. If you’d like another chuckle, go to my blog again and read today’s post. You know you inspire me. Thank you for your compassion and kind words. Well, well. I wrote this a week ago. I wondered then what I was going to do with it. In the past few months, four people I know have taken their own lives. In each case, but for different reasons, they found themselves in a tunnel of despair so black they could see no way out. In each case but two, the manner of self-inflicted death was different. The only woman found herself a widow—suddenly and unexpectedly—when her husband died of a massive heart attack. In her grief, she drowned herself in the cold waters of a large lake. A man, a husband and father, found himself financially ruined at what should have been the prime of his life, a time when most of his children are grown and on their own, his reputation in his profession cemented. Natural disasters and economic turmoil were the banana peels of his fall. The substances he turned to in an attempt to cope with chronic physical pain and mental anguish, only added to his problems. He chose hanging as his way to end it all. The third, a man who should have been able to see his senior years on the horizon, tallied yet another DUI after a life of alcohol abuse. Now, instead of his senior years, he saw only prison bars in his future. He used a gun. And the fourth, a man of my acquaintance rather than a friend, found himself and his business failing, and had no will to persevere. In a land of seasonal business, he discovered that bigger was not always better. He also chose hanging. And a long, long time ago, a sibling chose pills to end her despair. Those who are left behind, the widows, children and grandchildren, brothers and sisters, parents, in-laws and friends, cannot imagine despair that black. Many of us have been close to that tunnel, slogging through blackness so thick it was almost viscous in its tenacity, but we persevered. Somehow, whether through the aide of friends or family, a fear of what we contemplated, or perhaps a curiosity of what will happen next, we continued, shook off the cloak of darkness and found a small light at the end of the tunnel. PS: Ann, Stihl makes an easy start chain saw. They are wonderful! My sympathies on losing your friends. My best childhood friend also used pills. She used to telephone me from CA when she’d get to feeling down and no matter the hour, I’d talk her through the night. Nights are the worst. Then, one sunny Sunday afternoon, I got a call from her brother in Colorado. I’d sent her two letters that had both gone unanswered, but that wasn’t unusual for Beth, so I assumed she was busy and kept writing. When he intercepted the third letter, Larry finally screwed up the courage to call me to tell me my beloved Beth was gone. He gave few details. His grief overwhelmed him. I still have questions and anger. Why didn’t she call me THAT time of all times? Or did she try and I wasn’t there? I’ll never know and I have to accept that fact. Electric chain saws are very reliable, too, Ann – if you’re close enough to a power source and don’t need a long blade. We’ve a great one but I don’t know the brand. It’s yellow like sunshine! Thanks for the chain saw recommendation, Gullible. It was welcome comic relief!!! I hate to tell you all, but these perserverance writings are awful downers. Yeah, yeah, I know — we all have our sad stories, and they make us who we are. Sometimes I just can’t listen. Isn’t our writing supposed to be an expression of life, the joys and the sorrows? That’s what I like to read and write. Of course with all the genres out there, it’s obvious that not all readers are drawn to the same type of writing and every writer has his own sense of what he should write. Yeah, yeah, I know…mine was just another sad story. Dismiss it if you must. But, it’s mine and I’m sticking to it. What I know about perserverance is from a childhood teaching moment. As my mother read from that little hard back book with ten pages and a gold spline, I learned that big hills are brought down to size with the phrase, “I think I can, I think I can, I think I can.” The “Little Engine That Could” taught me that “I can’t do that” should never be said. “I think I can,” should be our first thought. Have I failed, yes. Have I forgotten the little engine’s words, yes. But, and it’s a big but, failing means I tried. Those things that I failed at, I eventually conquered, at least the majority of them. I could tell of plumbing disasters but I’ll reframe. Just this morning while I was letting the shower spark some feeling in my body, I started thinking about my writing. I thought about Gully, Beth W, and other fine writer’s that have submitted their writings to different places, in print and on the web. I have always stepped back from that, I guess I’m afraid of the rejection letters, but, and it’s another big but, I’m going to submit something before the end of the year. So keep me accountable, keep me thinking, I think I can, I think I can, I know I can. I know you can do this. Trust me, rejections are like badges of honor. Writing is so incredibly subjective, you just never know what will appeal to a given person on a given day. I wrote a story about my dad and submitted it to a site one of my teachers suggested. After months of hearing nothing, I decided it had been rejected and submitted it to another. They rejected it within 30 days and suggested I take writing classes. I laughed. About a month later, I got one of my SASE’s in the mail. Instead of pulling out the copy of my manuscript when I opened it, I pulled out a contract. The first place bought my story after 7 months! It can happen and it’s so much fun when it does. That situation helped me realize when I get rejected it only means that one particular person didn’t click with my submission on that particular day, but someone else might. It keeps me going. I hope my story will give you the courage to do this thing. Hey Walk, I hope you’ll follow through with your commitment to submit your work this year. I made that commitment January 1 of this year. So far, I’ve submitted a poem and a Creative nonfiction story. So far, I have two rejections! Yippeeeee!!!!! Am I disappointed? Yeah I reckon. But Barabara is right, just because you might get rejected at one place, doesn’t mean no one will accept it. She better be right, I’m counting on it. So I’ll just persevere and keep mailing the stuff out. Besides, carrying your written work to the Post Office is fun! So what are you waiting for–jump in the truck and make a beeline for the Post Office! I agree. I found rejection slips or letters to be sort of cool. Every writer who has ever submitted work to publishers gets them. It just felt good to know that what I’d written had at least arrived where I mailed it and that someone had acknowledged it. It was in a pile with the hopes of hundreds of other folks, just like me. We both have to get our rears in gear if we’re going to swap our not- too- soon- to- be published books, our don’t- hold- your- breath, autographed published books. We’re all in this together, Walk. We KNOW you can. Like you said, we just need to keep on trying. I looked up the word in the dictionary. It means to persist in spite of difficulties. But the word ‘endure’ kept shoving its way in front of perseverance, wanting its place in line. So, I looked up ‘endure’. It means to persist. To last. To suffer firmly or patiently; to bear. As I was flipping the dictionary pages to find ‘endure’, another word jumped out, waving its hands at me. ‘Entwine’. To twine together or around. And then another word caught my attention. ‘Endless’. Having or seeming to have no end. Is this a coincidence that these four words relate to each other? Maybe. Maybe not. I have endured perseverance. Endured the continual–not so patient–fighting to be heard. Or, at other times, suffered firmly to bear the seemingly endless difficulties of life–feeling as though one day, it all would entwine itself around my neck and choke me. But so far, it hasn’t. Maybe my definition of entwine doesn’t mean ‘twining around’. Maybe it means ‘twining together’. Maybe my perseverance and the monotonous, endless enduring, entwines with my granddaughter’s smile when she calls me “her granny”. Maybe her “I picked the flowers for you, Granny” keeps the difficulties from getting too tight around my neck. Maybe it’s the sunrise over the hill each morning that makes me thankful I have the strength to persevere one more day. Maybe if I continue to persevere long enough, I will understand the meaning. I bet having a granddaughter does do something special for you. I can see her holding up the flowers she picked for you and you just melting and yet reaching out and hugging her close. The word “severe” within persevere stresses the mind set we often need in order to keep going when the going gets tough. “What do you mean I have to be severe?” Marvin asked, more than slightly perturbed. Exasperated, Carole shook her head. Her hand closed around the cool steel wrench and she was sorely tempted, but she handed it over politely. She walked back to the garden and resumed her weeding. An hour later, her back aching, Carole stood up and stretched. She walked back to the front of the house. The pile of parts had diminished significantly and the lawnmower lay on its side. Marvin was attaching the blade. “I see you persevered,” she announced cheerily. “Where what?” Carole asked, irked. Carole stood with her mouth agape. Before she could try any further explanations, Marvin tipped the mower over onto its four wheels and pulled the cord. The engine roared to life. It sounded strong as though the mower was brand new. Marvin’s smile lit up his face. “You see what can be done if you just persevere?” he asked shutting it off. Now let’s go find your purse. I’m surprised you could figure it out! I just realized some of it did not copy over. If you’ll permit me an indulgence, I’ll try to do it right. Beautiful and pricelessly, humorously, wonderfully, fun. My husband of 19 days short of 40 years is getting hard of hearing too. I better sharpen up my sense of humor if this is an example of what I’m in for over the next 40. The lawn mower lay in a jumble of pieces on the driveway. Marvin sat on a stool that looked like it belonged in a kindergarten classroom. His knees jutted out so far he had difficulty reaching around them to find the next part he wanted. Exasperated, Carole shook her head. She walked back to the garden and resumed her weeding. An hour later, her back aching, Carole stood up and stretched. Curious about Marvin’s progress, she walked back to the front of the house. The pile of parts had diminished significantly and the lawnmower lay on its side. Marvin was attaching the blade. “I didn’t see your purse,” he said somewhat accusatorily. “What purse?” she asked, confused. Ann, your message came through loud and clear. To be a good writer one must? PERSEVERE! Despite my frustration, the craft is still dear. Thus, I’ll continue to post writing here. I need to practice perseverance. I tend to become frustrated when tasks don’t come easily. I have high expectations and don’t allow myself much room for error. As a result, I worry that I “bail out” too early and never reach my full potential (I think what I’m trying to say is that I quit, or, maybe worse, I hang back and never try in the first place). If I were to look back, I’d see many times when I persevered in the face of challenges but also several instances when I took the easy road and hung back to avoid the possibility of failure. Recently, I demonstrated that I am capable of persevering in the face of adversity. I need to apply that determination to other areas of my life. I may make mistakes along the way but mistakes are not unique to me – everybody makes ‘em! I’m guilty of letting fear of failure block my path. I think that’s what you’re saying above. It takes a long time to learn that failing is a step up above not trying at all. There is really no such thing as failing when we give ourselves an opportunity to at least try. Right? Perseverance walks beside me on the path of life. My life path has had many twists and turns often leading me into dark uncharted waters. Perseverance has been my lighthouse when sailing those waters. Perseverance who encouraged me to get out of bed after the owl escorted my baby’s soul to a better place. Perseverance who had my mouth saying the right words to the former lover as he held a loaded firearm to my head. Perseverance that enabled me to gerry fix burst heater hoses on my van, on a cold dark winter’s night kilometres from anywhere with Five children sleeping in the backseats. Perseverance keeps me in the kitchen cooking for the hungry while the waitress stuffs yet another order. Perseverance keeps me backspacing when I type form when I really mean FROM. Perseverance keeps me looking at the questions for the final exam in BWW all I need now is courage to step in so I can take that exam. Boy, your first input here is a whopper. I keep reading it over and over. The owl carrying your baby’s soul to a better place made me cry. The backspacing when you type form when you meant from made me laugh. I was writing an essay, a very important essay for a class. I proofed and proofed before I hit “submit”. Okay, it’s ready I thought. Soon as I sent it for the instructor and class to read, there it was. Big as a billboard on the interstate. Where I was supposed to have written “red” lipstick, I had “read” lipstick! And this was at the very end of the story and it just ruined the whole thing. Arggghhhhh. Take the final exam in BWW. You’ll be just fine. I hope you’ll be a regular here. I can’t wait to see more of your writing. Your writing is filled with so much emotion. Persevere and take the exam and then keep on writing. We’ll look for you here. I’d love to know how you came up with your nickname. Thank-you for your kind welcomes . Shaddy my nickname origins are a combo of two great loves-Meatloaf, the man not the dish and the Collingwood Magpies, a Aussie rules footy team. Cheers, Batpie! Good luck on the final. That should be 15 Reasons Why Not To Become A Writer or Mamas Don’t Let Your Babies Grow Up To Be Ernest Hemingway. I’m so glad someone else encounters glitches. Thanks, Walk. Very entertaining. I especially like the one about preferring your imaginary friends to your real friends. Made me laugh. That’s a good blog post alright. I enjoyed it. Perseverance: shopping at the mall with my sister. I sense that maybe your sister is indecisive. Is that it or is there something else that makes it challenging? Shaddy, right now, there are no words to describe it. Let’s just say perseverance is severely put to the test. My step-daughter used to want to go to every clothing store, try on several items but not buy anything until she’d seen every store. When she’d finished, she wanted to go back and buy the things she liked best. Half of the time she couldn’t remember where she’d seen them. Shopping with her took for-ev-er. Is she like that? You have my sympathies. Oh dear, no words to describe it. That’s bad. (Maybe I’m fortunate to have only brothers). Barbara–my sister will carry things around through the entire store (after she’s stood there trying to make up her mind to buy it) and then just before making the purchase, she’ll change her mind and go back through and put it all back! Or- if she manages to buy it and take it home, she’ll return most of it the following week. Oh I am sooooooo glad I’m the normal one. Oh dear, you DO have my sympathies. Perseverancid: A condition affecting persons who have persevered for long stretches of time and whose efforts have left them sour and rank. I’ve never met a Capricorn with so much energy… and such imagination… you’re an inspiration. Oh my! You’re making me wag my tail. Ha!! Yes! I’ve been wondering what that odor was. I think I’ll take a bath. Or maybe just stand out in the rain. Knock it off, Kathy. I wasn’t referring to you, but you made me laugh with your comment. I was just thinking how Barb used perseverance as inspiration for her humorous and cute story about Carole and Marvin and her purse. I was poking at the word and the syllable, rance, led me to rancid and the rest fell into place. As much as I desire to improve my writing, it’s disconcerting to learn I’ve been making so many mistakes. I feel like my lover just told me he doesn’t like the way I kiss. I’m not going to break off the relationship (yet). I’m still passionate about my lover, but now I feel awkward and self-conscious when we’re together. I try to spice things up and inject more “action” into our relationship yet, all the while, I second guess myself. Part of me longs to return to feeling a false sense of security about myself and my abilities – ignorance was bliss. However, I cherish my lover and aspire to the intimate relationship that comes with working through challenges together. I know my heart will forgive this blow to my confidence. The strain between my lover and I will soon dissipate. We will take our relationship to its full potential. I will persevere. You sure didn’t make any mistakes here, in fact, you rocked. That’s a powerful way to describe how you’re feeling. Mercy! That sentence evokes raw emotions. Where’d you get the idea that you’re making mistakes? If you’re making them, then I’m missing them. My motto is: just write for the love of it and the rest will come. I still remember the fun thing you wrote where you’re light-hearted side was arguing with your serious side. Now, go write. (My friend Sarie said that to me after giving me a pep talk. I thought it was so cute). Thanks, Shaddy. I’ll go write with my head held high. Oh, and just to clarify, that part about me being a bad kisser is pure fiction. The instructions lay scattered across the living room floor. Some were ripped in shreads. Others were crumpled up. Pages 45 through 100 were burning in the fireplace. Ann spent days trying to translate the booklet into plain, ordinary, common sense step-by-step language. But to no avail. Her strong sense of perseverance melted away like butter, therefore, leaving her limp and unable to assemble her brand new shiny chainsaw. No perseverance, no patience. Not even an ounce of appreciation for the printed words on the instruction booklet. In fact, she despised it after staring at it for almost a week. Ann watched as little bits of burning paper curled up in a red glow before turning completely to gray ashes. There was only one thing she could do now. She picked up the chainsaw parts and headed out the back door. She began mouthing some very unsavory words as she carried them down the steps. Her neighbors were peeking out their kitchen window. Fear was on their faces as they hid, watching their once strong and persevering writer-lady neighbor, make her way through the backyard. They covered their ears in disbelief as Ann told the chainsaw where it could go and what it could do when it got there. She stumbled into the overgrown woods along the back edge of her yard. Then she began flinging the parts as far as she could fling them. They hit trees. They crash-landed in muddy, murky ditches. 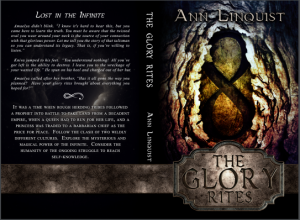 A bright, unnatural, sinister light shone in Ann’s eyes. An evil smile was cemented on her face as she didn’t stop until the chainsaw was destroyed. Finally, Ann slunk back to her house. She showered, watching the dirt and mud swirl down the drain. She dried herself and wrapped up in her big, thick terrycloth robe. She slipped her tiny feet into her slippers and padded off into the kitchen. She took down the phonebook and thumbed through the yellow pages. You took persevering where none of us dared to go. Splendid job, excellent job, marvelously written and easily imagined by your words. Yes, I think Ann is capable of these deeds. After all she puts up with, she has to let off steam somehow. I’m just grateful she didn’t get the chainsaw functioning and then become enraged. She lives rather far for us to be visiting her in prison. Yes, your version, Kathy, is the type of Chainsaw Massacre that I suspect Ann could be driven to enact. Whether fiction or non-fiction, I award you the grand prize for Persevering Excellence in this fine writers’ gathering place. Ta Da. Oh but, Barb’s story was terrific too. I award Barb the grand prize for Persevering Excellence also. Well, for crying out loud. As I scroll up I see Zelda, Walk, Gully, Batpie and even I submitted worthy words. I award the Grand Prize for Persevering Excellence to every cotton picking one of us. P.S. And so can all of you, and you better or else I’ll take back all my :)s and the awards too. I love your story from the title on down to “The End.” This is good stuff! Thanks for a riveting read. LOL, Kathy H. Good on ya! I knew without a doubt that the part about you being a bad kisser was fiction. It’s well-known that lonely writers made good lovers. Now, I’m not inferring that you’re lonely; I think all writers are lonely to a degree. We must spend a fair amount of time by ourselves or at least in our own little worlds while we write. I leave you with a 🙂 and a wink. Please see the post above that begins with KathyH, KathyH, KathyH. It’s got something for everybody. I don’t get how Fitzgerald’s quote negates my comment that writers are lonely “to a degree” and then my second comment that perhaps lonely isn’t the correct word. Lonely women make good lovers. (It’s the name of a well-known song). I wrote: Lonely writers make good lovers. It was supposed to be kind of cute, not a label or statement on the emotional state of writers. I’m a writer and I’m as far from lonely as one could get. We were sisters of a sort, thrust into a club no one wants to join, because the membership qualifications come with great pain and grief. We were wives who had survived our spouses. We met one day, we three widows, on the bike path where Depot Road intersects with the Seward Highway. It is the center of our town—the grocery store on one side of the highway, and the lodge, with the only restaurant in town, on the other. In the triangle of land where Depot Road juts off diagonally from the highway, is the community park, then the building that houses the community hall, library and volunteer fire station. It was a chance meeting that day, for I live six miles away and my reason for being there eludes me now. Perhaps it was to mow the grass on the highway embankment that parallels the community park. Kathy probably was there because she had volunteered to water the park grass and flowers for a week. Rosella lives just across the highway, next to the store. She also speaks to the Elderhostel groups that stay at the lodge, and may have been returning home. Then again, she may have seen Kathy and me and walked over to join us. For whatever reason, the three of us friends and sisters in loss converged on the bike path one sunny summer afternoon, and spoke of how we became widows. My husband’s death was the most recent, and Rosella told me she thought I had suffered the worst. She said that because my husband had died of Alzheimer’s Disease. For many years I had taken care of him and watched his essence disappear before my eyes, until I no longer recognized the man I had lived with for thirty years. Unspoken was the bizarre and tragic behavior of a person with a dementia disease, and the impossible stress on the caregiver. I spoke of how she had uprooted her life here, moved to Seattle while her husband was being treated for leukemia at the Veterans’ hospital. For a year she tended to his care, and then returned after he passed. She admitted it was difficult, but that at least she could talk with him and they could say their goodbyes, unlike my situation. I acknowledged the truth in that. Kathy’s husband had died suddenly and unexpectedly after minor surgery. His death had stunned our town, shaken us to our cores. There were no goodbyes for her either. Quite suddenly and without warning, her life was turned upside down. As we talked, acknowledging the pain in each other’s circumstances, and thereby extending our compassion and our understanding of the other’s pain, Rosella began to speak of another woman who lives in a nearby town. This woman’s husband, she said, was with his adult son at a small mining claim in the adjacent mountains. The son had to leave, and got assurances from the father that he, too, would be leaving soon. When the son departed, the father was standing in the shallow creek, wearing hip boots. He was never seen again, despite many searches, and no clues as to his fate were ever found. It’s been two years, said Rosella, and the woman keeps hoping he will some day walk out of the forest. That, we decided unanimously, was the worst. And while we felt deep pangs of empathy for the woman who waits and perseveres, somehow it eased our burdens a bit, because we knew what happened to our husbands. But not knowing, not having any idea, that would have been the worst of all. I agree. That said, you all suffered and persevered. That’s the beauty about writing. The darnest things can motivate us and the strangest things can come as a result of the motivation. I honestly think your story about Ann is fun and clever. Don’t squelch that part of you that wants to go off on a tangent, writing whatever comes into your mind. That’s where the real writer emerges; that’s when your uniqueness comes to the surface. Remember when we studied “first thoughts” in BWW. Those raw words that pour from us before we edit them to death are often priceless. When we give ourselves permission to “just write”, that’s when we’re happiest and often times at our best. Throw all the things you write in here or create a blog. What you’re doing when you write is important. Believe that and you’re on your way to more and improved writing. Kathy H., as Shaddy said, your piece was fun and clever. And, she also spoke the truth about just letting yourself write. Blogs are amazing things. Best of all, they are a place for the words to go. Shaddy, have you not noticed that one of your legs is longer than the other? That’s from me pulling on it. My comment about your statement that writers are lonely is controverted by Fitzgerald’s assertion that writers are many people. Thus, with multiple personalities within themselves, how can writers be lonely? Yes, Gully, I have noticed my right leg is longer than my left. With you “pulling it” and me kicking back at you with it, it’s a good deal harder to reach my foot to put that shoe on. I still don’t get your argument. With multiple personalities within themselves, writers will for sure be lonely at least occasionally. Everyone feels lonely either momentarily or for longer periods, it’s the way we’re made. Gosh, how I love a good debate. Blogs are a place for all the words to go. Hmmm. I don’t think I have alot of words and the few I have are misspelled, misplaced, and misused. Besides, I’d have to go to Blogging School to learn how to even make one and I don’t know how much that would cost and I don’t know where the closest one is because gas is going up again and I’ve spent too much money lately as it is because my youngest daughter is getting married in two weeks and you know how that can get out of hand, what with all the shopping I’ve had to do because I don’ t typically wear dresses so there’s that and then of course with the dress, I had to go and buy new shoes and now they are killing my feet because I go barefooted most the time and my daughters told me Mama get you some high heels to go with that dress and of course, I had to buy pantyhose and lord, do you all know how much pantyhose costs these days, oh the money I’ve spent and now I’m considering Blogging School to boot, I just don’t know if it’s worth it being I don’t have very many words…. Your youngest daughter is getting married in two weeks!!! You have the best reason ever for writing the Chainsaw Massacre story. I haven’t been in your shoes, but I can imagine… Hang in there, Kathy. I bet with the wedding, you feel like throwing things and that’s why you had Ann do it for you in your story. Yeah, I bet anything that’s what inspired your story. I think in psychological terms that’s called transference. Regarding blogs, it’s so easy to start up a blog. At the top of mine, there’s a CREATE BLOG link. If you click on that, it’s all spelled out for you. That’s all I did after being on Walk or Gully’s blog. I assumed it would be complicated so I avoided even considering creating one, but it’s not. You can have just a basic blog or you can jazz it up as much as you want. None of mine is of my own design. The background was one I chose from a few options offered. I chose my own colors to a degree but that was simple. If you want to try it, you can. If you’re not interested, then you won’t. I tend to think everyone’s like me and will enjoy what I enjoy; thank God that’s not the case. Millions of Shaddy’s!! Heaven help us all. Doesn’t seem to me that millions of Shaddys would be that bad. Lots of sympathetic, kind, gentle people in this world? What could possibly be wrong with that? I’ve been away for a day or two and you all have been writing up a storm. Thank you for the award, by the way. (deep, reverent bow) I accept gratefully. Everyone here is incredibly talented and I have enjoyed reading all that has been posted. There are plenty of awards for everyone. We can make our own. Pass the trophy! Welcome back, Barb and thank you. KathyH: I love your long, long, long sentence. It’s a great example of free writing. Do you remember that in BWW? It’s a super way to get the thoughts flowing and you’re a master of it. I think with free writing practice we can learn to draw from all the layers of ourselves and get to know what we truly feel, believe and think. When you don’t premeditate what you’re going to write, you’re more likely to write what you really need to and therefore should write. If what I said makes sense to you, then maybe you can explain it to me. Zelda: What does verklempt mean? Verklempt: choked with emotion, on the verge of tears, too emotional to talk. It’s Yiddish. Yiddish, huh. No wonder I was out in the dark, on the verge of tears. Thanks for clearing that up for me. That’s the kind of thing that keeps me awake at night. For those of you who don’t know what we’re talking about: Zelda used the word “verklempt” in a blog comment and when I stumbled on it I was stymied. Thus I caught up with her here and now we’re all smarter. Thank you, Zelda, from all of us here. Her slap literally knocked the snot out of Jack’s nose. “Damn allergies,” Jack mumbled as he sulked off to fifth hour class. Serena was still on his mind during class, but she was always on his mind. As he rubbed his cheek he relived the moment over and over in his mind. Yes, it was a slap, but it was physical contact, she actually touched him. He knew that he had to ask her again. And again if need be. Serena was sitting in the auditorium practicing her selections for the upcoming state musical contest. Most were classical, but one was one of her favorite jazz numbers. Her mother, before she died, sang “Summertime” to her as she went to sleep at night. The sensual tone she added to the piano brought the piece to life. Jack stepped in the door with his trumpet in hand. “Summertime” was one of his favorites also and he loved listening to Louie Armstrong wail it out as a intro to Ella Fitzgerald’s wonderful voice belting the verses out. Serena started her intro and at just the right measure Jack played an echo with all the lust and love that he had stored up for Serena, Louie would have been proud. Serena paused for a moment, but then proceeded, Jack adding licks that made goose bumps come up one her arms. After the intro Serena added her voice to the first verse. Her voice as sensual as the song had ever been sung. When it came to the second verse, Jack started belting it out, his voice full and alive. Serena sang the third verse again, which was the same as the first, and then they ended together. So Jack took his red slapped cheeks and Serena to the Bistro for lunch. Too bad he forgot his wallet that morning. Cute story, Walk. The ending was a true surprise. Nice job! Hey, look at you, Walk. Romantic Walk. That you are through and through. You’ll never leave that part of you at rest. I sense there’s a sequel. I hope so; I want more. Forgot his wallet. Hummmphh. Yeah, yeah. How convenient. Ha! I am so-o–o-o-o-o glad you asked Zelda. I was too shy. Gully, shy? Now you’re really pulling my leg. Walk. Walk, Walk, Walk. What a nice story. PESEVERENCE: Waiting for Maureen to write something. Ya! We’ve all stuck our necks out. Come on Maureen! That’s a pretty weak hook for my submission but I’m a bit weary and don’t really care. I pushed myself and now I’m pooped. I worked until noon, my normal Tuesday schedule. I drove to the Y, swam half a mile, showered, drove home, rode my bike 12.3 miles and then ran 3 miles. Every bit of that took perseverance, especially the running part at the end. So I’m awarding myself The Perseverance Award for The Day. I can do that because I’m Shaddy and I pretty much do whatever I want these days. I know it’s inappropriate and annoying when a person toots his own horn, in fact, it annoys the heck out of me when someone else does it. I just want to scream: Get over yourself, would ya!! The nice part of doing it online is I don’t have to hear you scream and cuss or even roll your eyes it that’s more your style. I’d love to hear how the rest of you used perseverance today. I must mention though, don’t even think that I’ll pass the award to anyone else for his efforts today, no matter what. Someone else can have it tomorrow, but today it’s around my neck. I can spot tall tales hundreds of miles away, so don’t try to pull one over on me, ya hear? Congratulations! You deserve the award! Tomorrow is my day at the Y and I couldn’t even swim ten yards, so you’ll have no competition from me. What do you do at the Y? Do you take a class or workout on your own? I do the nautilus weights mostly to try to restrengthen my arms. I had ‘frozen shoulder’ in both and temporarily lost the use of them. (serially – not at the same time) When I regained range of motion (after 2 yrs. of physical therapy on each side), I had virtually no strength left. The weights are helping. I have about 85% of my ROM on one side and 90% on the other. That probably won’t improve at this point, but I do notice a huge difference in being able to keep my arms up over my head for longer periods and in lifting even small objects since we’ve been going for a year. I also do about 40 minutes of cardio on either the elliptical machines or the treadmills. Bruce is the swimmer. He recently joined the Master’s swim team at the request of the coach, who saw him splashing around in the pool while I was doing my cardio stuff. He’s doing great and loving it. Why’s that, Gully? From picking up litter? Ingvar Carlsson took longer than usual to get ready that particular Thursday morning. Before he even considered getting dressed, he took the time to make his Grandmother Isabell’s special pannkaker recipe—for good luck. Pannkakers were not a traditional breakfast dish, but he needed comfort food. And shall we go for three? Three successful flips of three extra large extra thin pancakes were an encouraging sign. With a glob of lingonberry jam and a few sprinkles of powdered sugar, breakfast was ready. I better sit down and eat before my head catches up with my stomach, Ingvar convinced himself. The pannkakers were not quite up to the standard set by his grandmother, but they served their purpose. After rinsing the dishes, he decided to bolster his confidence by looking over his graduate portfolio. Fresh out of Lund University with a Master degree from the Centre for Languages and Literature, Ingvar was ready to set sail on his professional life. All the pieces in his portfolio proudly displayed the väl godländ distinction, the highest grade possible. His professors told him he had a natural gift, and they eagerly encouraged him. The enthusiastic student responded well to the consistent cultivation. Like a young seedling breaking through the winter snow to stretch towards the sun, Ingvar doggedly researched, clarified, edited, re-worded, reviewed, and double-checked every assignment to stretch himself towards his standard of excellence. He could not rest until each assignment was a perfect as he could make it. At the post-graduation ceremony reception, professors eagerly sought out Ingvar’s parents to extol their student’s rare, admirable perseverance. Ingvar was one of the top students in his language and linguistics class, but still, he was exceedingly lucky to have landed a position in the home office of the Husqvarna Group. Never one for gardening or outdoor power products, Ingvar tried to ignore the gnawing twinge of concern that he lacked a vital piece of requisite knowledge for working at this prestigious company. His professors always assured him it was the process not the product. If he had mastered the process, which he felt confident he had, then he could master this content. A glance at the clock revealed that it was 7 a.m., and he had to get dressed! Shave with a new blade. Shower with a new bar of soap. Button on a new, freshly pressed blue broadcloth shirt. Slip on a new pair of khaki trousers with cuffs. Lace on a new pair of brown leather shoes. Fold a new silk tie and stash it in a pocket of the new navy blue sport coat. Grab the new brown leather briefcase. Do the final check in the mirror. Stockholm was a new experience after university in Lund and growing up in Göteborg. The Husqvarna corporate offices looked like pages out of the ikea catalog: clear, bright, modern, sleek, full of white plastic, blond wood, and brushed stainless appointments. “Good morning Ingvar, and welcome to Husqvarna. After Annika gives you the tour and gets you registered in all our internal systems–e-mail, intranet, and such–I will give you your first assignment,” said Nils Yoriksson, Ingvar’s new boss. “Thank you, Mr. Yoriksson. I look forward to it, “ said Ingvar. Ingvar’s mind settled on the word that resonated, a word that signaled success: assignment. With his usual perseverance, he could succeed. His mind tried to convince his stomach that everything would be fine. Even though finding out where to find paper clips and how to access e-mail was rather bland, he had kind of hoped the blur of handshakes, new names, and professional smiles would have lasted a little bit longer than it did. Back at his desk, he saw, Mr. Yoriksson approaching. Ok, here we go. The first assignment…. “So how’d the orientation go? Annika has been with Husqvarna for 25 years, so she really knows how the place works!” said Nils. “Yes, Annika gave a great introduction!” responded Ingvar. Ingvar shifted his weight in his desk chair. The white plastic creaked. The resulting blush could not be quashed. Nils continued as if he did not notice. The quiet moment seemed like an eternity. Ingvar appeared to be looking at the words on the pages, but he was already lost in plotting his approach. “Do you have any questions?” asked Nils. “No, Sir,” Ingvar replied, not looking up from the passing pages of the instruction booklet. Ingvar forced a stiff smile that belied his inner panic. None of those notes to self ever made it into the instruction booklet. Exploding out of the demo room, Ingvar hurried back to his desk, reviewed the Swedish manual several more times, and then started brainstorming English phrasing. After typing only a few sentences, a tap on the shoulder tore him out of his cloud of thoughts. “Ingvar, you do not need to take over the company in one day. It is late and time for you to go home!” Annika admonished maternally. Driven, he wanted to craft such clear instructions that everyone from a lumberjack in Maine to a lady writer in California could easily operate the Husqvarna 240e. Ingvar worked all night, but time was still too short. Before he knew it, computers were booting up, chair rollers glided across the blond wood floor, footsteps became more numerous, and coffee aromas filled the air. The new workday was dawning. Just as Ingvar was printing draft four of his usual eight-draft process, an anxious Nils appeared to ask for the instructions. Knowing it was best not to apologize when turning in an assignment, Ingvar’s eyes were riveted to the ground as he reluctantly turned in his first assignment. Nils glanced over the English instructions quickly. Unbeknownst to Ingvar, Nils was not very fluent in English, so he could not really evaluate Ingvar’s work. A sheepish yet astonished Ingvar lifted his head to see a broad smile ignite Nils’ cobalt eyes and the streaming sunshine make his boss’s blond eyelashes glow. Nils rushed away to turn the instructions over to his boss, leaving Ingvar to worry about the lady writer and how she would fare with the instructions. He knew he had not done her justice, but he really had not choice. From that moment on, the lady writer became his inspiration. He vowed that he would do better byher next time and every other time, no matter what. “Come on Ingvar! Hurry or you will be late! Mr. Leon just arrived!” squealed Lotta, Ingvar’s administrative assistant. Her enthusiasm dissipated his daydream. Ingvar could not help but remember his first day with the Husqvarna Group. After all, today, he is going to become a member of Roger Leon’s executive team. Roger Leon is the Chief Operating Officer of Husqvarna Consumer Products North America. Over his 25 years with the company, Ingvar held fast to the vow he made his extra long first day with the company: All his writing and translation work was written for the lady writer in California. He developed a reputation for crafting the most user-friendly English writing that came out of the Husqvarna translation and localization department. His perseverance escorted him up the corporate ladder. This morning, he had made his Grandmother Isabell’s pannkakers—for good luck. His were still not as tasty as hers, but they still served their purpose. Welcome, Lassie! Excellent story. I especially liked the part about Grandmother Isabell’s pannkakers. I applaud and applaud and applaud. Then, abrupt silence follows. Within the quiet, I hear a pin drop and then absolute silence holds me still for three full minutes. If such is the case, ye learned your lessons well and tomorrow I will honor ye with The Perseverance Award for The Day. At the stroke of midnight tonight, the medal will hang about thy neck. Wear it with pride, my friend. Thank you, Shaddy and Walk! Yes, I was under the tutelage of the lady writer in California in an online course, though I do not know for sure she is in California. She inspired me, and I have been writing on my own ever since the course. I hope you visit here often, Lassie. What was your nickname in the class? When did you take it? It’s fun for me to remember people, and I don’t think I remember a Lassie. As you can see, you’ll have a warm welcome here. Lassie was my nickname in your early April 2009 ed2go class session. The group was very large and full of interesting monikers. Thank you for welcoming me. My work schedule prevents me from writing and commenting as regularly as I would like, but I look forward to participating. That class is still open, so I’ll go look for you. You’re right, it was a big class! You’re welcome here whenever you feel so inclined. I think we all have the same time problems, so visit when time permits and the spirit moves you. Lassie: I had a hunch that your submission here was your final assignment in BWW. Now I see it’s not. It’s amazing enough to qualify. You are most welcome here. We’re somewhat unruly at times but you’ll get used to it. Jump in anytime you feel inclined to hang out here. Good for you. You’ve come a long way with your shoulders. It sounds to me like a great example of persevering. At midnight tonight, The Perseverance Award for The Day, transfers from around Lassie’s neck to yours. Congrats! A word of caution to Ann: don’t let yourself be swayed by the dulcet tones and admirable writing of the wee Lassie. Stihl’s easy start chain saws are way better than any Husqvarna product. I own a Husqvarna snow blower, not that you need one down there. Gullible, you found me out… Ha! Ha! I must confess to knowing absolutely nothing about chainsaws and found the bit about easy starting in an online review of various chainsaw models. The foreign manufacturer caught my eye. Husqvarna’s Web site looked more Swedish than Stihl’s looked German, if that makes sense. I know someone who will appreciate your testimonial.